Welcome to the College of Engineering and Computer Science! We offer a host of degree programs that are in high demand and quickly growing across the region, the nation, and the world. We routinely meet with industry and government advisory boards to insure that our academic programs provide a firm foundation for employment and career advancement. Our undergraduate programs in engineering, computer science, and technology are designed for an easy transition for students coming directly from high school, students transferring from our many regional partners and other institutions of higher education, and continuing education students. Additionally, we offer flexible pathways, including evening, online, and hybrid course offerings. Graduates from our M.S. and Ph.D. programs are in high demand by regional employers, but are also competitive in the international research arena. For those with more specific interests, the college offers minors and certificate programs to supplement your education plans. 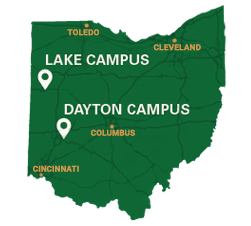 Graduates of our academic programs command some of the highest starting salaries and highest employment rates on campus, and Wright State University's competitive tuition rates and scholarship opportunities help you get there at minimal cost. In addition, we offer an array of scholarships targeted specifically for engineering and computer science majors. There are also fantastic employment opportunities while still completing your degree. Internships are widely available with local employers to complement your coursework, provide real-world experience, and ease your financial burden. Finally, the college routinely employs students as teaching assistants, graders, and help room tutors. To broaden your college experience, consider joining one of our many student organizations. There, you will find peer support, friendships, professional development opportunities, and engagement in international outreach. While finding their way to a promising career, our students build life-long relationships and professional networks. Within the College of Engineering and Computer Science, you will find faculty and staff who are available to help and are supportive of your professional goals. We are dedicated to achieving the best outcomes for our students, partnering with local employers to stimulate regional economic growth, and developing global leaders in engineering practice, research, and development. At the College of Engineering and Computer Science, it is our mission to educate an enterprising community of leaders who seek to improve the human condition by bringing discovery and innovation to the world. Our graduates are uniquely prepared to advance frontiers of an expanding host of fields through contributions in both technology and entrepreneurship.